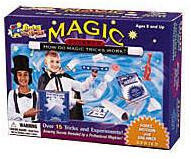 Perform amazing feats of strength and balance, and display mystical control over seemingly normal objects. Canes hang unsupported; rings roll uphill; nuts and bolts unfasten themselves; and prove that you're stronger than anyone you know! Buy 1 for $13.31Buy 2 / Save $0.71!Buy 3 / Save $2.66! Size (inches): 3.54" X 11.81" X 8.86"
Smithsonian Science: Crystal Growing - Grow Your Own Crystals!